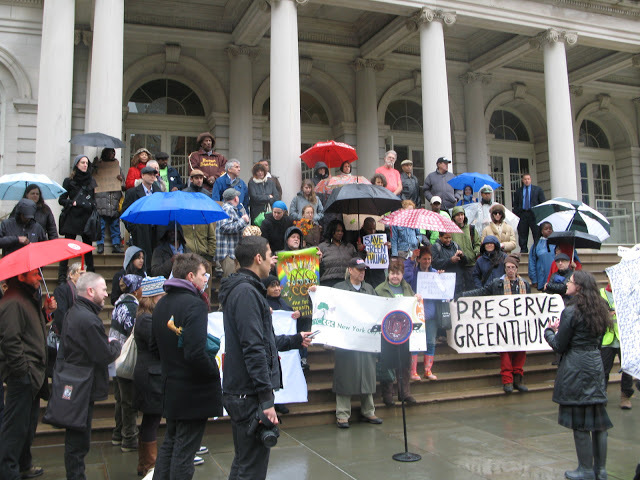 Bronx and Manhattan Land Trusts had several representatives at the “Rally to Save GreenThumb” on Tuesday, April 5th at City Hall. Attending were executive director, Erica Packard; community organizer, Catherine Wint; board member, Edie Kean; and Davidson Avenue gardener, Kim Brown. The rally was in response to cuts to community block grant funding, which funds the GreenThumb program in New York City. Find out more about the rally, sign the petition to save GreenThumb, and more at New York City Community Garden Coalition.